Luxury wide beam boat Henley-On-Thames, winner of 'Four In A Bed' Channel 4. Property 29: Luxury wide beam boat Henley-On-Thames, winner of 'Four In A Bed' Channel 4. Volharding Barge - On the River! 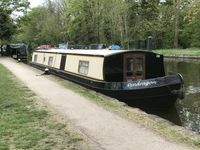 Property 36: Volharding Barge - On the River! From start to finish a truly magical experience. Cathy is a great communicator who quickly answered all our questions prior to the trip. Upon arrival we were met by Cathy who introduced us to her brand new floating palace. The interior really is special and would put many a boutique hotel room to shame. The layout is carefully thought out with plenty of relaxing space, together with a fully equipped kitchen. We found storage space everywhere with all the fixtures and fittings of the highest quality. 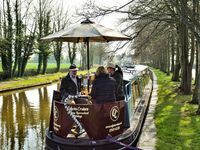 The boat engine is fitted with a fantastic silencer which meant conversation was easy on the large aft seating section. This area had enough room for a removable table and parasol (all supplied). Cathy gave us detailed maps and suggested itineraries, all of which made our holiday even more special. We had a wonderful time on an amazing boat. We shall be booking again for next year. Really great boat! Everything we needed for a wonderful holiday! We had a lovely time cruising into London and mooring at Little Venice. It was so much cheaper than staying in hotels and eating in restaurants. The wood burner kept us nice and warm and there was plenty of hot water. Pendragon was easy to handle and great fun taking it through the locks. Would recommend!